is available here as pdf. Lots of interesting information, and a few striking maps. Hopefully, the fact that it's all in Russian won't be much of a problem in this day and age. N1c-Tat is a general feature of the Russians, but N1b-P43 is only really found at any significant frequency in the northern groups. A strong contrast of E-M78 between central (present) and northern (absent) groups, consistent with a late introduction of this haplogroup in easternmost Europe. South-Central-North decreasing frequency of R1a; now, it's not clear how R1a came to be in Russians: some of it may be legacy of its initial entry into Europe from the east, other could be of historical import, and may have even arrived during the Slavic expansion from Central Europe. The pattern probably is the reverse of the high frequency of N1, indicating increasing importance of Finno-Ugric substratum in the north. Fairly interesting that of the two likely "Balkan" haplogroups E-M78 and I-P37, the former is modal in central region, the latter in southern one. The absence of both in "deep Asia" suggests a late introduction, as mentioned before, but when? My most immediate observation is the set of mainly Indian highly divergent haplotypes on the left. There has been (well-deserved) excitement about recent Y-SNP progress within this haplogroup, but we should not neglect the occurrence of outliers/relics in our reconstruction of a haplogroup's history. I'd love to see those few Indian haplotypes SNP-tested using the currently available SNPs, or even used to develop new SNPs for this important Eurasian haplogroup. That's not an analysis of R1a1-M198, it's an analysis of Asian R1a1-M198 (Altaian, Central Asian and Indian). So essentially it's an analysis of R1a-Z293. 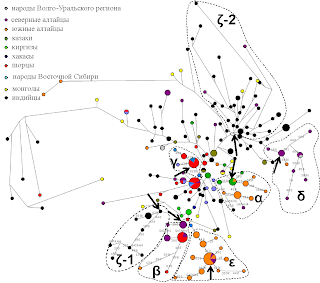 Moreover, the Siberian haplotypes in this network apparently suggest that R1a1-M198 has an ancient presence in Siberia, but it probably arrived there from the west. Balanovsky. An interesting pedigree there. He appears to be a son, and an employee, of Dr. Elena Balanovsky. The lab is funded by the government to establish the genetic underpinning of Russianness. Elena Balanovsky readily discusses selective breeding of "more authentically Russian" population through govt. subsidies, the genetic "causes of criminality", the need to take genetic makeup into account for hiring, and similar peculiarly sounding genetic applications. And she is also quoted as explaining that the genetic similarity between Russian and Finno-Ugric uniparental markers may be used by Russian government to deny any accusations of discriminations against Finno-Ugric peoples or supressing their culture. PS: It took me a while to get through the thicket of xenophobic webpages citing the Balanovsky's (especially the part claiming, on the basis of uniparental markers, that the Golden Horde didn't leave a genetic trace in Russia), but eventually I discovered a markedly more reasonably interview of Oleg Balanovsky. There's no support for the theory of Siberian origins of R1a1a in its SNP structure. The STR haplotypes that Klyosov used to formulate this theory were very limited. All the main SNP branches of R1a1a overlap in Europe - Z283, L664 and Z93. On the other hand, all Asians, except West Asians (ie. those closest to Europe) carry Z94, which is below Z93. The Golden Horde didn't leave any genetic trace in Russia, because Russians don't carry Turko-Mongol Y-DNA markers like C3 or R1a-Z94, except in very unusual cases (most likely from internal population movements during Tsarist and Soviet times). There are low levels of Y-DNA C across Europe, but this is actually European-specific C with its own SNP mutation which isn't found in Asians. 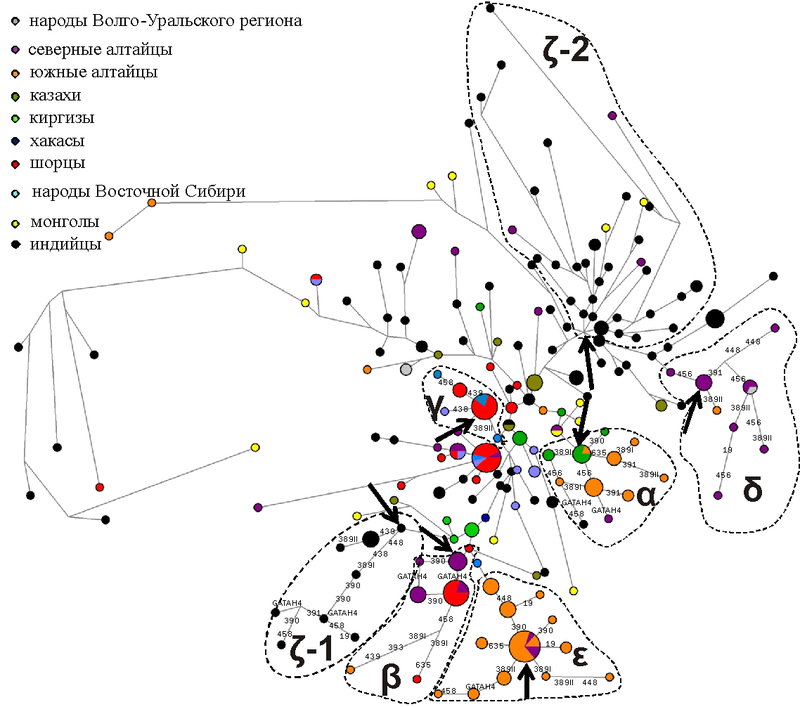 The low levels of Siberian-specific mtDNA lineages in Russian populations can be explained by prehistoric migrations into Europe well before the Mongolian incursions. Ancient DNA shows that Mesolithic groups in Northeastern Europe carried such markers. In any case, why would Mongolian invaders leave mtDNA in Europe and not Y-DNA? If anyone actually has hard evidence of Mongolians leaving any genetic influence in Europe, I'd really like to see it. Thanks, Davidski! Actually the sample collection locations in Balanovsky's Y-DNA database conspicuously avoid the homelands of Mishars (Mişər / Мишари) in Volga, Oka, and Sura river basins. Most of the Mishars (originally Turkic Muslims and Christians at the service of the Royal Russian government) completely assimilated, with their descendants considering themselves ethnic Russian for generations. mtDNA-wise, the Mishars are similar to their Finno-Ugric neighbors, but their legends tell of their origin from the Horde chieftains, and Y-chromosome of the Mishars has not been studied. 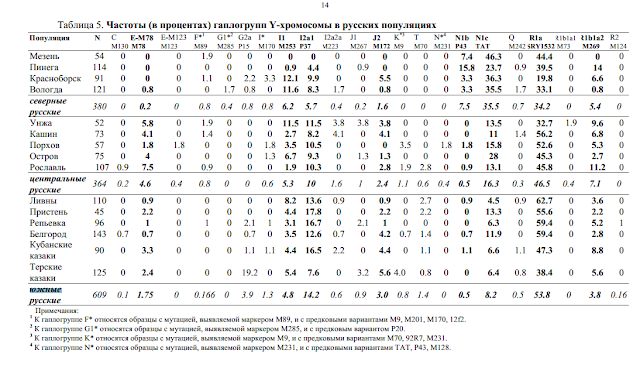 Most peculiarly, Balanovsky collected 3 sample sets of ethnic Russians from the areas with historically Mishar populations (82 from Mikhailov, Ryazan region; 86 from Spassk-Ryazansky; and 76 from Tambov) but used these 3 sets _only_ for mtDNA studies, excluding them from Y-chromosome mapping. So I wouldn't be surprised if the ethnic Russians of Volga-Oka basins turn out to have substantial Y-chromosome input from the Horde. In fact I suspect they did, and were excluded from Balanovsky's dissertation because of that. These Siberian lineages might look highly divergent at 6 or 17 STRs or whatever, but in all likelihood they'll fit snugly under Z94 when tested for that mutation. The phylogeography of R1a1a places its major expansion somewhere in or around Europe, probably during the Copper Age. We're definitely still in for some surprises as far as this haplogroup is concerned, but these won't have much to do with Siberia or Central Asia. They will probably concern links between Southern European, West Asian and South Asian Z93, and the origins of the Western European-specific L664. I look forward to some Y-DNA results from regions of Russia near Mishar country. They might well reveal lots of C3. Although that won't really change the way I view the genetic origins of the bulk of the ethnic Russians west of the Volga. Yes and no. The old Mishar domains are mostly long ways West of Volga (Ryazan is near Moscow, and Tambov and Penza regions, immediately abutting Ryazan on the South-East, are still 200 to 300 miles West of Volga. 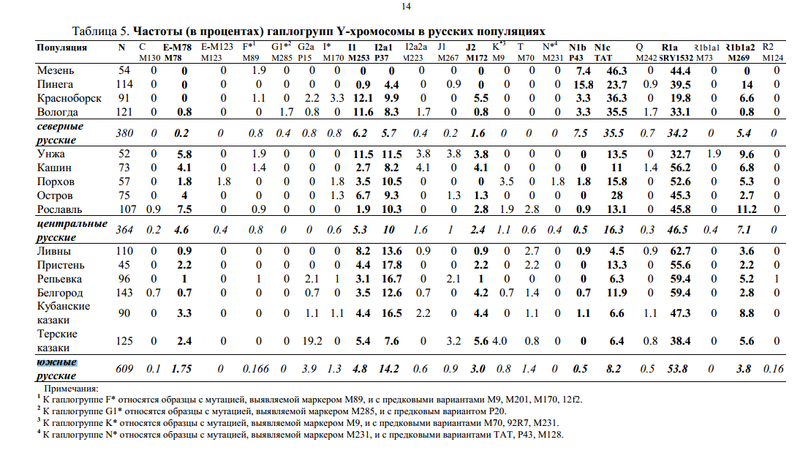 And the three regions (oblast's) have much greater rural population than many of the more Westerly provinces in Balanovsky sample set. The three oblasts range from 1.1 to 1.4 M pop, compared to only half as much in Novgorod, Pskov, or Kostroma oblast's (extensively covered by the study). So if you define Russian-ness the Balanovsky way (rural and immobile, living for 3 generations in the same district), then the South-Eastern regions may have a lot more Russians than the North or the West.